Maritzburg United have their work cut out as they face an on-form Black Aces at the Kanyamazane Stadium on 27 September 2015, 15h00. Aces are unbeaten in five matches and are in third place on the Absa Premiership standings while the Team of Choice are yet to win this season and find themselves at the foot of the table. The two sides have met on eight previous occasions in the league with Maritzburg winning four matches, Aces three, and one draw. The KZN side have however only beaten AmaZayoni on one occasion on the road. United picked up only a single point last season against the Mpumalanga side and will determined to make a statement of intent by getting one over Muhsin Ertugral’s high-flying side. Aces’ line-up from their 2-1 win over Arrows: Walters, Kobola, Mzava, Ngalo, Nonyane, Manyama, Jayiya (D. Masina 69’), Matsi, Khuboni, Mbesuma (S. Masina 83’), Sherman (Modiba 63’). 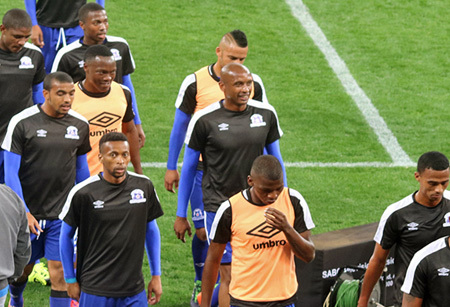 Maritzburg’s line-up from their 3-2 loss to Stars: Vries, Mngonyama, Teyise, Zulu, Pantsil, Moholo (Anas 71’), Lentjies, Shai, Hartog, De Jong (Mokate 88’), Rusike (Mekoa 54’).